Every now and then – well, quite a lot actually – we get alerted to a title that could either build a small cult following or prove a painful misfire. 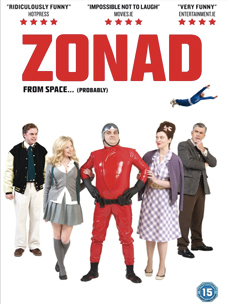 Such is certainly the case for Zonad, an oddball Irish comedy from co-directors and writers John Carney (Once, On The Edge, Bachelor's Walk) and Kieran Carney (Bachelor's Walk, The Last Furlong), and which the press release claims filters the nostalgic community of The Quiet Man through a 1950's sci-fi B-movie with Mel Brooks and Billy Wilder providing the laughter track. Some have groaned, but was called "Gleefully unhinged" by Variety and "Uproariously funny" by The Irish Times, so here's hoping.